The cold windy weather which comes with December is not a friend of my skin! I usually suffer from dry and dull looking skin this time of the year, but thanks to Lush this has been turned around! My skin is probably the most moisturised it has been all year and still has a glow to it (despite the lack of sun!). 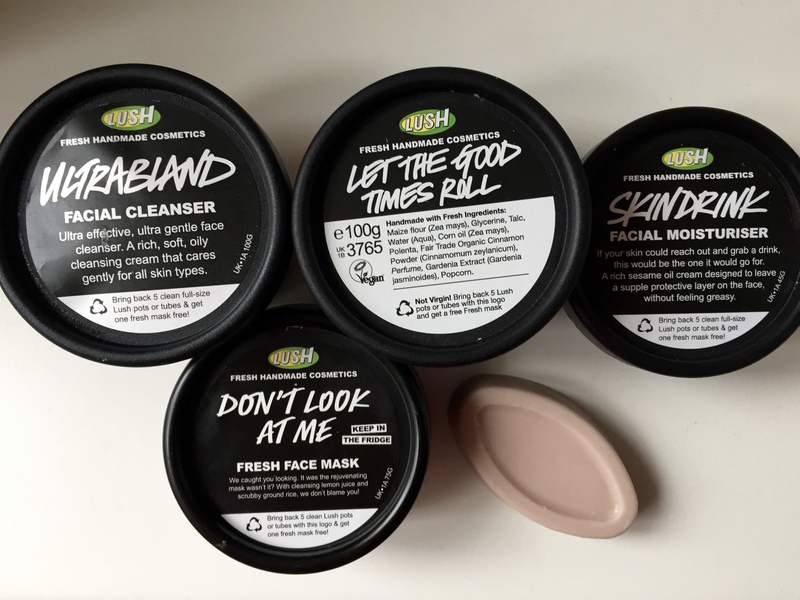 Here are the products I am currently using and loving from Lush. I definitely recommend you pop into your local store and get a skin consultation to find your perfect skincare combo! Let’s be honest, as much as we all love wearing our favourite make-up products to the Christmas party, there is no better feeling than TAKING IT ALL OFF at the end of the night! Ultrabland will take off all your make-up with ease and leave your face feeling super soft and moisturised. This is my morning go-to! I can start my day with my face feeling super smooth and smelling of delicious buttery popcorn! The polenta and maize gently exfoliate your face and set you up nicely for the day! It quite literally feels like your skin is having a well needed drink! You only need to use a small amount as the oils and butters work with your skin to ensure it is super moisturised. Your skin won’t start drying out once you walk outside to greet a cold and windy day! This bright blue fresh face mask gently exfoliates the skin with the lemon juice helping to brighten the skin, making you feel Christmas party ready! As with all the fresh face masks, keep them in the fridge and use them up within 2-3 weeks. Over the past couple of years, my skin has shown redness during the colder months. This fresh face mask is great at combatting that. The rose oil and calamine work great at soothing and calming the skin. It also smells AMAZING! This beautiful product moisturises the skin without it feeling to heavy. This is also a great balancing product for people with combination skin as it also helps to control greasiness with the calamine powder. If I don’t use Ultrabland before bed, I like using this before I go to sleep as a night cream. It’s also great to apply before using a face mask as it helps it come off SO much more easily. I have been loving my skin so much this month with the help of these products! An we all deserve to love our skin! What products are in your winter skincare regime?! I would love to try the serum bar. What type of skin do you have and who would you recommend it too? Currently I’m obsessed with ultrabland and angels on bare skin. I know that mask well, and if I’m ever having a breakout I’d defo reach for it! !